The very first Lotus Seven sports car prototype was fitted with a Coventry Climax engine, disc brakes on all four wheels, and a De Dion back axle. When entered in hill climb and sprint events, it swept all before it, and caused quite a stir. 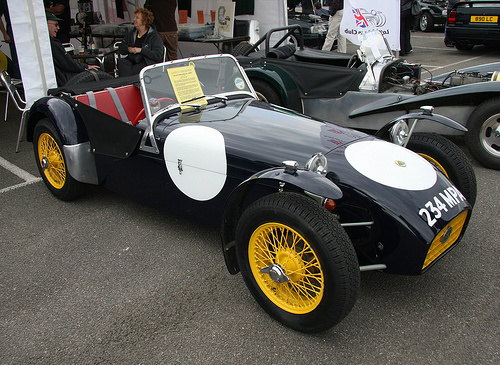 In July 1957, the Lotus Seven was launched at the Earls Court Motor Show. This later came to be known as the Lotus Seven "F". The target market for this model was low budget club racing, epitomised by the 750 club. Its handling was praised, and the lightweight chassis enabled the car to produce a lively performance for that time, with 0-60 mph in 16.2 secs, and a top speed of 80 mph, and even 85 mph with the windscreen replaced by aeroscreens. This was the car that maintained the financial viability of Lotus at that time. The selling price of the assembled car was twice that of the kit version, and it was no wonder that the latter was the most popular choice. The reason for this huge price differential was due to the hefty levels of purchase tax on manufactured cars. On the other hand, car components were exempt from purchase tax, and it was for this reason that, in the 1950's, the sale of kit cars turned into big business. As the car became more popular, alternative engines were offered which generated higher output. It came to be known as the Lotus Seven "C". In October 1959, a replacement was the 948 cc BMC "A" Series engine, as fitted to the Austin-Healey Sprite, and which was sportier than the original Ford 100E unit. This engine developed 48 bhp and 52 ft/lbs of torque, had a top speed of 81 mph, with 0-60 mph in 12 secs. In the UK, it was designated the Lotus Seven "A", whilst those exported to the US were assigned the title Lotus Seven "America".